Plan on arriving early! The event begins at 5:30 AM and the earlier you start, the longer your ride. We recommend starting at 7:00 a.m. to get the most out of your time on the Drive. Make your ride as short or long as you like by using turnarounds located along the route. Feel free to take a break. There are three rest stops along the route where light snacks and water are provided. >> Central Rest Stop - Columbus Drive and Jackson Drive. Fruit, water and light snacks are available at rest stops. We encourage you to bring your own water bottle to help cut down on unnecessary waste and don't forget to display your rider number, helmet number and wristband to ensure access to the rest stops. If you have any special dietary needs or want more than a light snack, feel free to bring your own food to the event. All riders will receive their necessary materials in their Rider Packets. Rider packets will be shipped through the mail, or will be picked up at a Packet Pick Up prior to riding in the event. Your rider packet will include a rider number, helmet number, and wristband. These items must be visibly worn while bicycling on Lake Shore Drive and shown at checkpoint and rest stops along the route to show you are a registered participant. You will also receive an official Fifth Third Bike the Drive ride guide in your rider packet which includes helpful information about the route, festival and event sponsors. 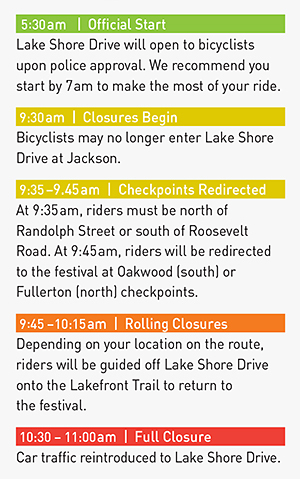 Unregistered riders can register on the day-of event at the festival (Columbus and Jackson) or at either checkpoint (Fullerton and Oakwood). A number of local bike shops will be on hand as well, with services like free safety checks, and minor repairs, such as flat tires, etc. (shops may charge for parts and major repairs). Thank you to the Chicagoland bike shops whose mechanics will be on site to assist riders experiencing troubles with their bikes – just in case! The event is also supported by hundreds of volunteers who will ensure that you have the best experience possible. Course Marshals, Ride Marshals, and SAG Vehicles are stationed throughout the course for riders who need support. Riders are required to show their rider numbers and wristbands at checkpoints along the route. Checkpoints are for the safety of all riders and ensure that only registered participants enter the ride. Fifth Third Bike the Drive is the Active Transportation Alliance’s main fundraising event for the year. 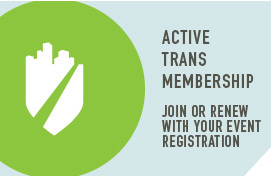 Proceeds from the event allow Active Trans to carry out its work of making biking, walking and transit easier and safer throughout the Chicago region. Please slow down as you approach a checkpoint. Checkpoints are also a designated safe turnaround point where riders can change directions on roads fully closed to car traffic. You don't have to start there, but the live music, breakfast, and sponsor contests may entice you to end your ride at the post-ride festival in Butler Field. Re-fuel with a pancake breakfast while you groove to the live music. Pancake Breakfast tickets are $10 and can be purchased during your registration or on site at the festival. Stash your bike in our free Bike Valet while you peruse the offerings from our exhibitors. Many bike industry and bike-friendly businesses will be on hand with freebies, samples and other offerings. Finally, swing by the Active Transportation Alliance tent to learn more about what we're doing on bicycling, pedestrian and transit issues in your community. The Festival will be open from 8:00 AM to Noon. The Active Transportation Alliance and our festival partners look forward to seeing you and your family after the ride!